I love One Kings Lane, I have bought a few carpets and other Objects d'art from there before. Its mostly LADY STUFF but once in a while you find something cool. 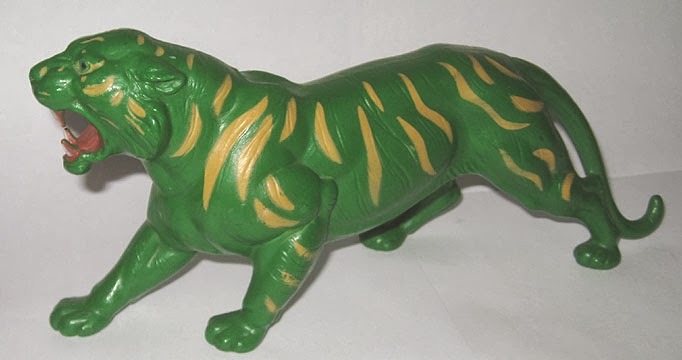 This is the second time this object has come up and Ive been tempted to buy it because I happen to have a gold Skeletor and this "mid century african tiger" - ALL OF THAT MAKES NO SENSE BTW- is just a cast made from Panthor, Skeletors pet or Battle cat, He-mans Pet (They were the same mold just different colors) cast in brass. I may be OLD but Im not THAT OLD and I wouldnt call 1985 MID CENTURY. Furthermore there are no tigers in Africa, Tigers are ASIAN. Please remember this for your lives. It makes me bonkers when people say AFRICAN TIGER. Its like saying AFRICAN MOOSE. So dear One Kings Lane, please recognize that this is just some crappy mold that someone in India made from a toy in 1985, which I totally appreciate but not for 150$, and that there is no such thing as an African Tiger. - Battlecat, as you can see the exact same mold. This video drives me nuts for the same reason.